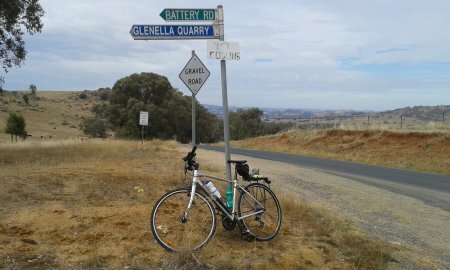 After joining Bike North about 18 months ago, the mutterings about Cowra start … such a fun time … the cycling is so different to your weekend rides … the scenery is great and all with a friendly bunch of people. On a ride to Windsor after Christmas last year lead by Alison with John, Lucy, Francis and I, the Cowra seeds were sown a little deeper and ultimately meant that all of us would take part in the Cowra experience, John and Alison as repeat enthusiasts. At work the response was varied; Cowra? Where is Cowra? Why would you go there to cycle? A bike festival in the country? 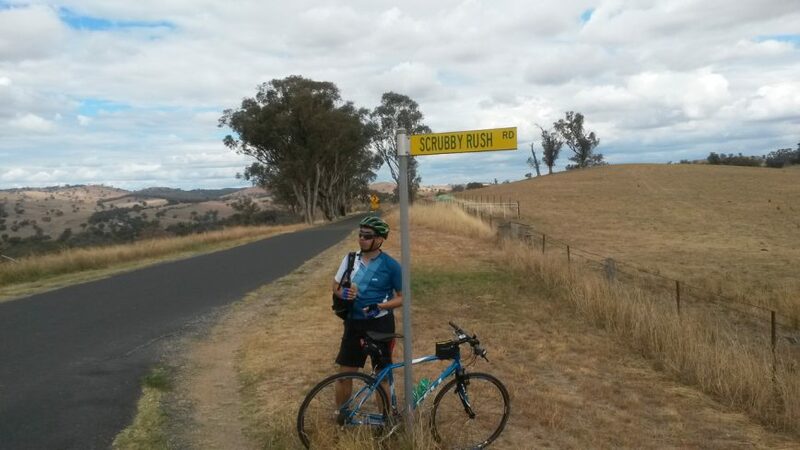 Kind of … You mean you are cycling from Sydney to Cowra? No! You are doing circles around Cowra on a bike? Not exactly circles … You ride every day for four days? Yep! but you don’t have to. 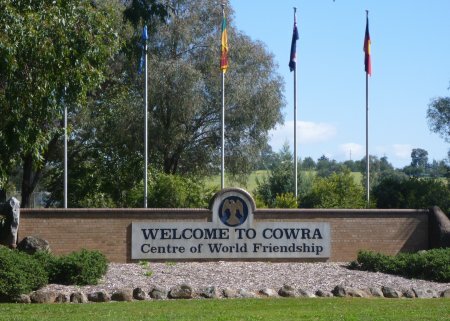 Cowra is a town of nearly 10,000 people, a four hour drive inland from Sydney (thank you Alison!) 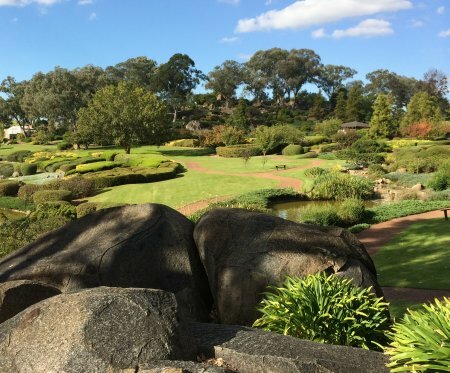 and has its fair share of motels, as well as a camping site, supermarkets, all the international fast food joints (which can be easily avoided), local eateries, wineries, attractions like the Japanese gardens and surrounding smaller quaint tidy towns with craft shops and cafes with their own highlights. And if you are a golfer, you can partake in a tournament which is held over the same weekend. Matt and Fiona were excellent in organising the routes for each day, kickstarting the day with the ‘sign on’ and briefing at 8:45am, distributing provisions such as bananas, muesli bars and lollies to up to 80 riders, and providing lots of smiles and encouragement (thank you!). Day 1 to Mount Collins was 57km. What struck me most were the beautiful open spaces, straw coloured fields with granite boulders, scattered rows of Eucalyptus trees, towers of bales of hay, and sheep and cows watching us ride by. A fantastic feeling of freedom and very Zen. Day 2 to Gooloogong and Canowindra was 107km and a little wet near the end but the drizzle was refreshing and not really a nuisance. Again long stretches of riding without stopping with soul feeding scenery, and coffee and burger stops for more conventional feeding. 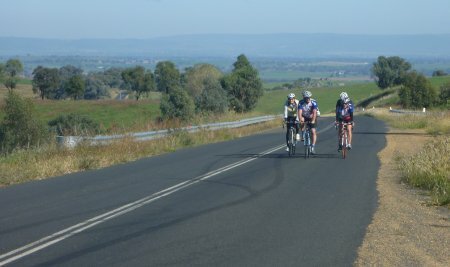 Day 3 to Wyangala dam was 82km with hilly climbs and picturesque lookouts as rewards. Spent some time exploring the dam on foot, enjoyed a well stocked country burger and taking photos. Marjorie’s innovative chalk art work on the road led our group home. Rudimentary methods proved to be more reliable than the GPX files favoured by some. Day 4 to Woodstock was a wet wet wet 52km. Fair weather riders spent their time in the local shops, cafes, gardens, or accommodation whilst the rest of us were addicted and couldn’t stop or had had a rest day and considered this ride their last hurrah. There were some hills, hopping kangaroos in the distance, cartwheeling tumbleweeds and lots of rain and fog. By this time even my little pinkie was sore, the hills were a struggle but achievable and there was Roger as a benevolent wind break (Yay someone taller than me, thank you!). In all it was a fantastic experience, it was my first time riding four days in a row, my first century, first time riding in a peloton and my first time playing Bananagrams (thanks Marilyn!). You know you have done quite a bit of riding when on the way home, you are in the car and start leaning into the turn when the car goes around the corners. Thank you to all the stalwarts for spreading the word of this awesome event, to the newcomers for taking the plunge, to Francis for being encouraging and a resolute fun companion, to Doug for perpetuating the philosophy of Bike North and again to Matt and Fiona for the seamless organisation. Can’t wait to scratch the Cowra itch next year! 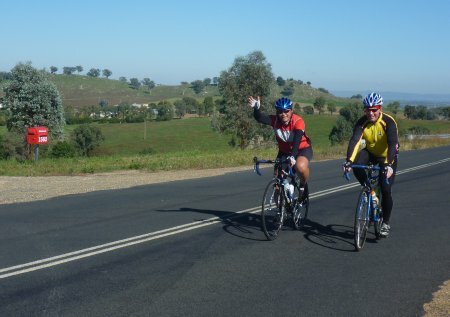 FIRST THOUGHTS : I had heard about Tour de Cowra in previous years but hadn’t been tempted to go, but I really enjoy cycling in the country so thought this would be a great opportunity to do this. It’s also fun to go away and enjoy cycling with people that you ride with in Sydney. PREPARATIONS : I made sure my bike was in good working order and had spare tubes and puncture kit ready to go. Packed wet weather gear and sunscreen to cover all conditions. As far as fitness goes I made sure I rode every weekend before the TDC including some longer distances and some hills. On reflection … I wish I did some more hill climbs beforehand. DAY 1 : Not knowing what to expect on any of the rides this was a good warmup! Lovely ride with fantastic scenery and a chance to meet and chat with other riders. The last 2 kms or so up to Mt. Collins I did at a snail pace which might explain why I didn’t come across to many other riders … except for those who were thundering back down the hill with smiles upon their faces because they had already made it to the top. The view at the top was certainly worth it. It was a great first ride. DAY 2 : The challenge for me on this day was to do 100 kms which I had never done before. So when I set out I didn’t realise I would be joining a peloton. That was a great experience … although I was wishing I had a better bike like those in front of me and maybe not so many bananas and muesli bars in my pannier … alas the group got away from me … never mind! I soldiered on at my own pace because I wanted to complete the 100 kms and I didn’t care how long it took me. The scenery was once again fantastic. The rain was not really a problem as it wasn’t cold just a little more care was needed to remain safe. 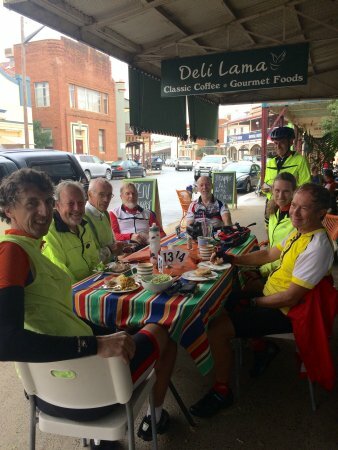 Lovely lunch stop at Canowindra but still a long way to go yet. So off I set again. ‘just keep pedaling I told myself’, and I did … and I made it to the end. I was quite proud of myself. A little weary, a bottom that wanted to get off the saddle but happy I had made it. DAY 3 : So after completing the 100 km ride the day before I thought how hard could an 80 km ride be? I didn’t realise how hard and it was certainly the hardest ride I have ever done. I set off feeling good and ready to face the challenges ahead. I felt like the snail in the bunch again. I just put my head down and focused on one hill at a time. The 6 km uphill was interesting!!!! It was great having Matt and Jeanette going around in the car making sure we were all Ok. Jeanette’s words of encouragement really spurred me on … I couldn’t let her down! Fantastic scenery on this ride again. The end of the ride couldn’t come quick enough … as it was getting harder to find a comfortable seat on the bike! I made it to the end feeling a little weary but again very happy that I had challenged myself and made it. ACHIEVEMENTS : Definitely completing a 100km ride and challenging myself to do the harder rides. DIFFICULTIES : Getting used to all the hills and riding longer distances without the frequent stopping like you do when riding in Sydney. POST RIDE : The socialising was fun. You could do as little or as much as you wanted to. The cafe was a great little spot to begin and end each ride yummy food and a chance to see how everyone went. ORGANISING : Matt did a great job of organising everything. It all ran very smoothly. No problems with the motel accommodation or travelling to Cowra. Such a nice place to spend Easter. ADVICE : Keep on riding throughout the year so you are well prepared when the time comes. Don’t worry about if you can do the rides or keep up … because it is great that each ride has a shortcut route to take … and you don’t feel pressured into keeping up with the pack because you can go at a pace that is comfortable for you. Most of all … enjoy yourself! FIRST THOUGHTS : I heard it was a popular event and as their was no country riding tour planned I decided to give the TdC a go. PREPARATIONS : Had the bike serviced a couple of weeks earlier. DAY 3 : This was a great ride, doing 25 kms less than the previous day, should be right. “WRONG” tough hilly ride, but very spectacular, great scenery. Helps justify the steak and chips for dinner that night LOL. ADVICE : Bring good wet weather gear and a good attitude. PREPARATIONS : I am a new to riding and an average rider, I’m glad I knew how to change a tyre (as most of my friends don’t) and I was surprised that I was last to finish a ride. DAY 2 : I enjoyed the ride, especially until the first stop where we rode in a large group. Changing a flat, put us in the rear. It wasn’t a hard ride. DAY 3 : Again, a great ride. Nice to have a shop to carb/protein load during the ride. Another flat at the top of the big hill, again put us in the rear, where we missed a turn and had a longer trip home (over 100km second day in a row). DAY 4 : A good, easy ride but I was surprised no alternative short ride was prepared for the contingency of wet weather. HIGHLIGHTS : The politeness of the locals, not one horn was tooted, even when riding 10km/hr up a long hill with double white lines. And the local waving as I rode past. And meeting the MC (Motley Crew) aka The Windsor Cyclists. ACHIEVEMENTS : Riding every day (including Thursday prior). I rode 320 km over 5 days & felt no ill effect while riding (but my neck is still sore as I write). POST RIDE : I stayed at the Caravan Park. I would have liked a larger marquee with trestle tables where we could gather, sit and eat in a large group. The indoor kitchen was good, but not large enough. ORGANISING : Great. 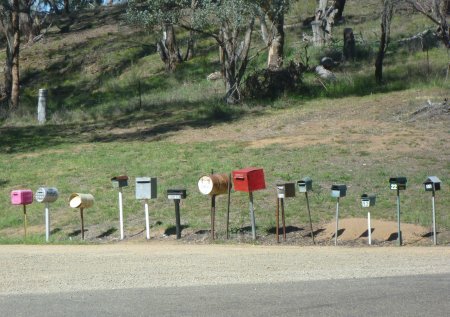 I really enjoyed the weekend and found the travel to and from Cowra much easier than I expected for Easter Long weekend. The campsite was well equipped and it was nice to all be located in the same area. Maps were good but could have done with more details such as town and street/road names. More than two ride options each day would have been an improvement. Perhaps we could sign on to rides the day before with expected ride speed to help us buddy up. RECOMMENDATION : Yes, trying to convince friends to come. A great weekend. ADVICE : Push yourself a bit and try to ride a on faster rides to build up strength. Don’t bring alcohol. Make sure you have the organiser phone number in your phone in case of delay on a ride.